The season for tricks + treats is upon us! Kids of all ages can’t wait for candy and costumes. Pumpkins, spider webs and ghosts adorn front porches everywhere; and haunted houses and scary movies are the preferred form of entertainment for many this month. But why exactly do we have these traditions? Jack-o’-lanterns: The tradition of carving pumpkins for Halloween has its roots in Celtic folklore. The legend tells of a man named Jack who was unable to get into heaven or hell when he died, and his lost soul was condemned to wander purgatory. He used a lit turnip to light his way and the Celts believed that putting Jack-o’-lanterns outside their homes would help guide lost spirits when they wandered the streets. The Irish people originally carved turnips but had to resort to pumpkins when they came to the United States because turnips were scare here at that time. Trick or treating: Trick or treating started in the 1930s and became a popular US custom in the 1950s. It’s not entirely clear where the US practice of dressing in costumes stems from, but it was believed in olden times that Halloween marked a time where the barrier between our world and the spirit world was the thinnest. It was thought that ghosts could cross into the world of the living and might disguise themselves as humans and knock on doors asking for food or money. People believed that if you turned them away with nothing, you the spirit could curse or haunt you. Bobbing for apples: Apples used to be thought of as a sacred fruit that could be used to predict the future. Bobbing for them was a fortune-telling game where it was believed that the first person to get hold of an apple from the water would be the first to marry. If the bobber was able to catch an apple on their first try, it meant that they would get to experience true love. Those who took many tries to obtain an apple would have fickle and unreliable romantic experiences. Another belief was that if a girl put her apple under her pillow on Halloween night, she would get to dream about her future husband. All of us at Garden Supply Company wish everyone a Happy Halloween! If you need a pumpkin or any decorations, stop by and see us! Eat the seeds: Pumpkin seeds are incredibly healthy! They contain protein, magnesium, potassium and zinc. So, cut off the top of the pumpkin, scrape out the insides, and rinse off those seeds. You can roast them in the oven with a little olive oil and salt and they are a delicious and nutritious snack. Even if you don’t like to eat them, birds love dried pumpkin seeds, so put leftover seeds out as a treat for the birds. Make pumpkin stock: The inside of the pumpkin has its uses too. Separate out the seeds and put the stringy pumpkin innards into a water-filled pot and bring to a boil. Let the mixture boil for about 30 minutes or until the water has changed color. Strain out any leftover pieces and now you have pumpkin stock! It is great for adding flavor to casseroles or soups. You can easily freeze for later use. If you don’t want to make pumpkin stock, birds also love pumpkin guts, so you can put that out for them as well as the dried seeds. Cook pumpkin fries: A quick Google search brings up dozens of recipes for pumpkin fries. Making pumpkin fries is a fairly easy process: you simply need to peel the skin off and cut the pumpkin into strips. Spices can be added as you like, and then bake at 350 degrees for about 30 minutes. Here is a really easy recipe from Savy Naturalist: http://www.savynaturalista.com/2013/09/30/roasted-pumpkin-fries/. Make pumpkin hummus: How about some yummy pumpkin hummus? Dreena Burton’s Plant-Powered Kitchen has an amazing recipe for pumpkin hummus: http://plantpoweredkitchen.com/pumpkin-hummus/. Pumpkin hummus is a fun appetizer for autumn parties! Cook homemade pumpkin puree: If you’re interested in making your own pumpkin puree, which can then be used for any number of recipes, check out this guide from City Girl Farming: http://www.citygirlfarming.com/Recipes/ByVegetable/CookingPumpkin.html. She gives information on a couple different methods of creating your own pumpkin puree and it’s surprisingly not very difficult. Pumpkin puree is used in a ton of recipes, including pumpkin biscuits, pumpkin bread, pumpkin soup, and even pumpkin cocktails. Create a flower vase: Use a pumpkin as a festive flower vase. Cut off the top and remove the innards as you would for carving, but then place a container inside. Fill that container with water and flowers and you have a fun, one-of-a-kind vase! We have pumpkins, so stop in and see us! Our friendly staff can get you set up for all your fall pumpkin and plant needs. This fall, bring the family to our Garden Supply Co. pumpkin patch for the best selection of pumpkins and gourds in town. And don't forget your cameras to capture those precious family memories at some of our favorite photo-op spots throughout the garden center. 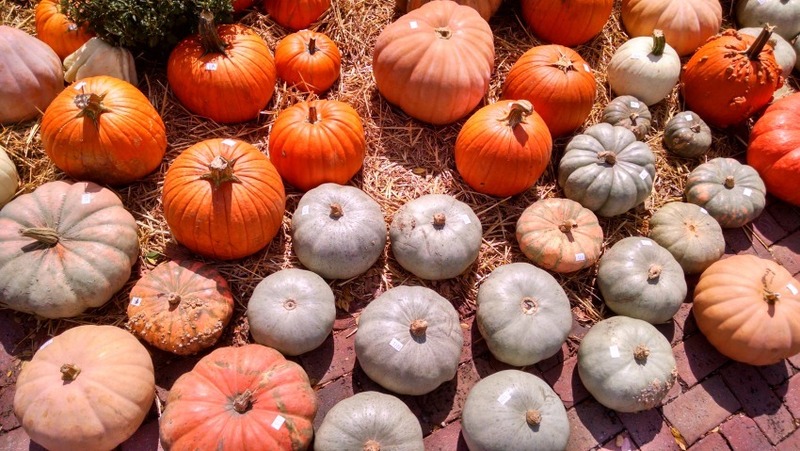 Besides our fabulous selection of pumpkins at our Garden Supply Co. pumpkin patch, we have all your favorite fall plant and gardening supplies. Stop by to stock up on fall-blooming mums, pansies, violas, ornamental cabbages and kale, and ornamental grasses. Now is also a great time for seeding and fertilizing fescue lawns. We have everything you need in our Gardening Essentials section in the Greenhouse. Life is beauti-fall at Garden Supply Co.